In this stand-alone companion to The Only Thing to Fear, it's been eighty years since the Axis powers won World War II with their genetically engineered super soldiers, and America has changed drastically in the hands of unforgiving victors. But there are still those citizens who aspire to what the country used to stand for: freedom for all. 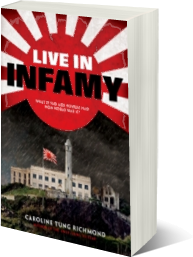 In the Western American Territories, Chinese American Ren Cabot has lost nearly everything to Imperial Japan's rule. After the public execution of his mom for treason five years ago, Ren's family lives under constant scrutiny of the Empire, afraid that one wrong step will rip apart what remains of their family for good. But with the Second Revolutionary War starting in the Nazi-controlled Eastern American Territories, a rebellion is making its way across the land. When a chance encounter with a resistance group offers Ren an opportunity to save lives and quite possibly topple the government, he agrees to their deadly plot. But his role will lead him straight into the heart of the enemy, and if caught, death would be a much better fate than what the Empire will do to him . . .